The iconic rapper is a Steelers fan, but he was at Browns practice getting familiar. The Cleveland Browns are finally good enough, funky enough, marketable enough for a mega celebrity that is not from Ohio to claim the team and publicly be associated with the franchise. Superstar rapper Snoop Dogg paid a surprise visit to Browns practice on Wednesday. 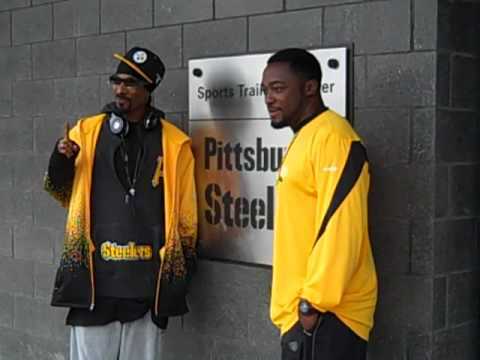 Supposedly, he and head coach Hue Jackson are cool, but we definitely didn’t see any signs of Snoop — an avid Steelers fan — popping up at the facility when Hue was suffering through a 1-31 start. With Cleveland boasting a promising 2-2-1 record and in the thick of things in the AFC North, it’s all good. It’s never cool to be associated with losers, especially when you are one of the biggest winners in hip-hop history. Visiting Cleveland’s camp at this juncture is a typical celebrity and marketing power move by Snoop for several reasons. Snoop is a cat from Long Beach, Ca. who bleeds black and gold, but he was blasphemously in town to promote his “Redemption of a Dogg” stage play, which comes to Playhouse Square on Oct. 28. He toured the arch-rival Browns’ facility, made a brief appearance on the club’s in-house radio show “Cleveland Browns Daily” and made a cameo on the field at the end of practice. While Snoop tests the theatre, his legendary Death Row labelmates Tha Dogg Pound crew will be on a mini-US Tour that will take Daz Dillinger and Kurupt to several California locations in October and December and a stop in Denver, to perform in front of sold out crowds with some special guests scheduled to appear; among them Bone Thugs-n-Harmony, Ice Cube and E-40. It’s common knowledge that the “The Dawg Pound” is also the name of the bleacher section behind the east end zone in FirstEnergy Stadium, so it’s a marketing match made in heaven and Snoop Dogg couldn’t help himself but to exploit all of the positive things transporting on multiple levels. In addition, when the Browns start contending for NFL championships, Snoop can say that he was on the bandwagon early and ride the wave with his head up. To be a diehard Steelers fan and rep the Browns in any capacity used to be a fireable offense. Jackson was reportedly hyped about Snoop’s visit, but it also compelled him to speak to his players and caution them not to get caught up in folks jumping on the bandwagon after a few wins. Cleveland Browns head coach Hue Jackson talks about Snoop Dogg’s visit to watch some of their practice. Wednesday, Oct. 10, 2018. Welcome to the taste of victory Hue Jackson. You wanted to win. You’re getting it. You wanted a franchise QB. You got it. You wanted respect as a head coach and culture builder. You’re earning it. So expect to no longer be the last guy to receive an invite to the winner’s party and embrace the moment — like Snoop does.